The congress "Arsenic in the Environment" offers an international, multi- and interdisciplinary discussion platform for arsenic research aimed at practical solutions of problems with considerable social impact, as well as focusing on cutting edge and breakthrough research in physical, chemical, toxicological, medical and other specific issues on arsenic on a broader environmental realm. The congress "Arsenic in the Environment" was first organized in Mexico City (As 2006) followed by As 2008 in Valencia, Spain and As 2010 in Tainan, Taiwan. The 4th International Congress As 2012 was held in Cairns, Australia from July 22-27, 2012 entitled Understanding the Geological and Medical Interface of Arsenic. 5. Special topics on "Risk assessment of arsenic from mining", "Geomicrobiology of arsenic", "Geothermal arsenic", "Rice arsenic and health perspectives", "Sustainable mitigation of arsenic: from field trials to policy implications", and "Biogeochemical processes of high arsenic groundwater in inland basins"
Hosting this congress in Australia was welcome and valued by the local scientific communities. Australia is a mineral rich country where mining has generated significant economic benefit to its people. Unfortunately historical mining for base metals, gold and arsenic had led to environmental contamination of arsenic. Locally produced arsenical compounds were widely used as pesticides and in timber preservation. It is known that there are several thousands of cattle- and sheep-dip sites contaminated with arsenic in Australia. However, commonly observed symptoms of chronic arsenic poisonings such as those found in endemic-blackfoot areas are seemingly absent from these types of environmental contamination due to good quality of potable water supply. Does this fall in the classic argument of "the dose makes the poison"? 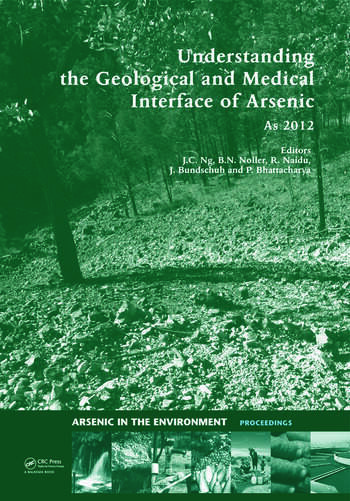 This congress theme of "understanding the geological and medical interface of arsenic" will advance our knowledge in minimising the risk posted by this so-called number one prioritised contaminant – arsenic. Phytoremediation of arsenic—does it work? Bilirubin oxidative metabolites: Novel biomarkers for acute arsenite exposure? Phytostablization of arsenic: Is it possible by growing Salix spp. in the contaminated sites? Arsenic response in roots of Eucalyptus spp. Groundwater arsenic mitigation in Bangladesh: Mission achievable or impossible?